If you put the same amount of time and energy you’d spend completing an MBA into doing good work and improving your skills, you’ll do just as well. Every successful business (1) creates or provides something of value that (2) other people want or need (3) at a price they’re willing to pay, in a way that (4) satisfies the purchaser’s needs and expectations and (5) provides the business sufficient revenue to make it worthwhile for the owners to continue operation. At the core, every business is a collection of processes that can be reliably repeated to produce a particular result. By understanding the essentials of how complex systems work, it’s possible to find ways to improve existing systems, whether you’re dealing with a marketing campaign or an automotive assembly line. Often times not worth the cost. Too much theory, not enough real world problems. MBA programs don’t guarantee high paying jobs. Business schools don’t create successful people. They simply accept them, then take credit for their success. Business school is a big risk. Should you choose to enroll, the only certainty is that you will shell out about $125,000. Such a figure correlates to a $1,500/month non-deductible loan repayment and a ten-year period of time in which you will not be able to save a red cent. 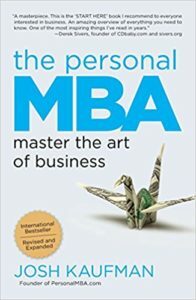 According to Pfeffer and Fong’s study, it doesn’t matter if you graduate at the top of your class with a perfect 4.0 or at the bottom with a barely passing grade — getting an MBA has zero correlation with long-term career success. None. The quickest and easiest way to screw up your life is to take on too much debt. Financial stress can destroy relationships, threaten your health, and jeopardize your sanity. Your job as a businessperson is to identify things that people don’t have enough of, then find a way to provide them. Some businesses thrive by providing a little value to many, and others focus on providing a lot of value to only a few people. 10 ways to evaluate a potential market for a new business. Rate on scale of 0–10. Sum of 75+ is potential for an idea. When any two markets are equally attractive in other respects, you’re better off choosing to enter the one with competition. Here’s why: it means you know from the start there’s a market of paying customers for this idea, eliminating your biggest risk. Don’t be shy about showing potential customers your work in progress. Nobody — no matter how smart or talented they are — gets it right the first time. Most drivers don’t buy expensive off-road-capable vehicles because they actually drive off the road. They buy them because off-road capability makes them feel adventurous and bold, capable of meeting any driving challenge. Believe it or not, it’s often wise to turn away paying customers. Not every customer is a good customer: customers who require more time, energy, attention, or risk than they’re worth to your bottom line aren’t worth attracting in the first place. Your job as a marketer isn’t to convince people to want what you’re offering: it’s to help your prospects convince themselves that what you’re offering will help them get what they really want. Raising your prices can increase demand by appealing to a more attractive type of customer. The best salespeople are the ones who can listen intently for the things the customer really wants. If you discover why, how, and how much your offer will benefit the customer, you’ll be able to explain that value in terms they’ll understand and appreciate. Understanding the value you can provide your customers is the golden path to a profitable sale. Present yourself to the prospect as an “assistant buyer.” Your job is not to sell the prospect a bill of goods: it’s to help them make an informed decision about what’s best for them. Accepting this small offer creates a psychological need to Reciprocate, subtly stacking the deck in the salesman’s favor. Prospective car buyers who accepted this free offer were far more likely to purchase a vehicle, add optional accessories, and agree to less attractive financing terms. As a result, these customers spent thousands of dollars more than the people who did not accept anything from the salesman while negotiating. That doesn’t make rational sense, because the coffee or cookies cost the dealer very little, but Reciprocation makes it more likely that the buyer will “pay back” the favor with a much larger concession. Do whatever you can do to provide something that unexpectedly delights your customers. Accounting is the process of ensuring the data you use to make financial decisions is as complete and accurate as possible. The Cash Flow Statement is straightforward: it’s an examination of a company’s bank account over a certain period of time. The Income Statement contains an estimate of the business’s Profit over a certain period of time, once revenue is matched with the related expenses. Believe it or not, there are only four ways to increase your business’s revenue: Increase the number of customers you serve. Increase the average size of each Transaction by selling more. Increase the frequency of transactions per customer. Raise your prices. If you want to do good work, taking care of yourself isn’t optional. Nutrition, exercise, and rest are the inputs your body converts into productive energy. Poor (or too little) input inevitably reduces the quantity and quality of your output. People respond twice as strongly to potential loss as they do to the opportunity of an equivalent gain. Eliminate this perception of risk by offering a money-back guarantee or similar Risk Reversal offer, and people will feel the decision is less risky, resulting in more sales. Great management is boring — and often unrewarding. The hallmark of an effective manager is anticipating likely issues and resolving them in advance, before they become an issue. Some of the best managers in the world look like they’re not doing much, but everything gets done on time and under budget. The problem is, no one sees all of the bad things that the great manager prevents. Less skilled managers are actually more likely to be rewarded, since everyone can see them “making things happen” and “moving heaven and earth” to resolve issues — issues they may have created themselves via poor management. It’s perfectly okay to change your Goals. Sometimes we think we want something, only to find out later that we don’t want it so much anymore. Don’t feel bad about that — it’s called learning. The more people know your capabilities and respect the Reputation you’ve built, the more Power you will have. Comparative Advantage also explains why diverse teams consistently outperform homogenous teams. Having a wide variety of team members with different skills and backgrounds is a major asset: it increases the probability that one of your teammates will know what to do in any given circumstance. If every team member has the same skills and the same background, it’s far more likely the team will get stuck or make a preventable error. There’s a reason high-performing surgical teams, military units, and sports teams tend to be small and focused: too much time spent in communication and coordination can kill a team’s effectiveness. Everyone has a fundamental need to feel Important. The more Important you make them feel, the more they’ll value their relationship with you. People will be more receptive to any request if you give them a reason why. Any reason will do. Dale Carnegie recommends “Giving others a great reputation to live up to.” He was a wise man — raise your expectations of others, and they’ll naturally do their best to satisfy those expectations. Here’s the golden rule of hiring: the best predictor of future behavior is past performance. Checking references at this point is a good use of time. Question should be simple: Would they work with the candidate again? If they hesitate or talk around the question, it’s a no. If you can’t reach a reference when you call, leave a message and ask them to contact you if the candidate is extraordinary. If they are, you’ll receive a return call. If they aren’t, you won’t. Finally, give promising candidates a short-turnaround project or scenario to see how they think, work, and communicate firsthand. Small projects tend to work best for skilled technical employees, while scenarios work best for candidates who will be responsible for product creation, marketing, sales, business development, finance, and management roles. The outcome of the assignment should be a deliverable of some kind: a report, a pitch, an asset, or a process. If you want to build a system that works, the best approach is to build a simple system that meets the Environment’s current selection tests first, then improve it over time. Over time, you’ll build a complex system that works. The more tightly coupled the processes in a system are, the more likely failures or delays will affect other parts of the system. Self-education, whether it’s about business or anything else, is a never-ending process.